Accidentally came out wrong but I like it. So, have been using the E-P1 intermittently for about a week now, with various c-mount 25mm f/1.9 lenses and recently a Voigtlander 12mm f/5.6. Thoughts - well, the E-P1's performance, at least how I have it configured, doesn't match a real DSLR yet in terms of shot to shot speed. Despite using it on MF, there is still a delay between shots, and still some shutter lag. I've read somewhere that the shutter lag is caused by the metering - to fix, press half down to lock the meter then make the exposure. Will try this out. NB: since the following images have been downsized to 800x600 or thereabouts, you won't get to pixel peep at stuff like noise and sharpness and all that stuff. I shot RAW+JPEG and did some post processing in Aperture on the JPEGs - I know fuckall about image editing and these adjustments are just what looks best to me, which usually involves Can't wait for Aperture to support E-P1 RAWs, which I estimate will occur sometime in 2015. All my 25mm f/1.9's vignette, which effectively turns my E-P1 into a $650 Holga. Nice! Shot at ISO 1600 - noise at 1600 is much better than my E-520. Was raining in NYC and struggled to find a ISO/aperture combination to keep the shutter speed above 250. As you can see noise is very prominent when the image is underexposed. Not sure how the RAWs will clean up but the JPEGs seem to be okay. The first two are 800 I believe, and the last one is 6400, which is probably unusable IMO even in B&W. All of these were with the VC 12mm. Corner sharpness using the VC 12mm seems perfectly fine - I'm not really a pixel peeper though. The only thing I had trouble with was shooting at such small apertures, that and the fact that I'm still learning my way around the camera. Biggest peeve in terms of usability was the delay in-between shots, which was often a second or more even if you mash on the shutter button right after you take a picture. Thinking one of those Sandisk ultra-fast SD cards might improve it. Considering exchanging the VC 12mm for a VC 15mm which gives a 30mm EFOV and about 2/3 more of a stop - however have read corner-smearing is more pronounced with it. One thing about the VC 12mm is that the focusing range is so small - about 80% of the range is from 1 feet to 5 feet, then it's infinity. The VC 15mm seems a little bit more flexible as it goes from 1 to 10 feet before infinity. Manual focusing with the 25mm f/1.9's isn't so bad - in fact I've gotten pretty good at guesstimating focus with it. Feel that it works better with lenses that have short focusing ranges. All of my c-mounts do about 330 degrees from short focus to infinity - so you get stretches where you're turning the barrel and not seeing any change at all on the screen, which is frustrating. Manual-focusing the 12mm is almost impossible unless you're zoomed in, cause everything's so small on the screen! It's still not 100% of the camera I hoped it would be when I purchased it, but a lot of it is stuff that ought to be fixable in firmware, and Oly generally has a pretty good history with firmware updates. Worth paying the early adopter fee? I certainly feel much more liberated when using it - the shutter sound is barely noticeable on the street, I feel much less self-conscious than when hearing the mechanical whir of my E-520. Still wish it could be quieter however. Lightroom already supports the new Panasonic micro-4/3rds camera (as of v2.4), so E-P1 support can't be far behind. But that doesn't help with Aperture (are they usually a bit behind Adobe with raw support?). I have read that the E-P1 seems to be optimised for use with the kit lenses (and I've seen surprisingly good images with the 14-42mm) so the wide mount compatibility may be a bit of a double-edged sword. The shots above seem a bit oversharpened (but soft at the same time) but that could be a result of the resizing. You don't do Flickr, do you? Cos you could do click-through links to images there where, if so inclined, people could pixel-peep at the original/larger sizes. 12mm is plenty wide enough though, isn't it? Yeh! Aperture is notoriously slow for new camera support, they have yet to support the G1/GH1 for example. I think much of it has to do with how they're planning on supporting the metadata about lens distortion and CA correction. Olympus Studio (Olympus's in-house software) is a pig to use. Downloaded Raw Photo Processor which 'supports' the E-P1 but that's also a pig to use. You're right about Olympus optimizing for their own lenses - and it seems to extend to their 4/3 lenses as well. The E-P1 is different from other current Oly offerings in that it has a significantly reduced anti-aliasing filter over the sensor, so Oly lenses, which were designed to provide obscene amounts of resolution for the smaller 4/3 sensor, really shine on it. There are some pics in the DPReview M4/3 forum taken with a 14-54mm which look stellar in terms of absolute IQ - too bad I've already sold mine, ha, ha. One guy on there thinks it takes even better pics than his 1DsMkIII w/ 85/1.2L! Good eye on the oversharpening - I discovered yesterday that I had accidentally set the Sharpness in-cam to +2 because of reading that doing so helped with focusing on the LCD. I do have a Flickr, but cleaned it out in a fit of reorganizing pique a few weeks ago and haven't really thought about how to put things up back up again in a way that makes sense. Plus I'm not really a fan of how they tend to apply a saturation curve to all the pics. Thinking about getting a Voigtlander 21mm f/4 for a 42mm 'normal' FOV. The 12mm is almost too wide - I've never shot with a 24mm EFOV lens! Very challenging to use - it'll take a while to learn how to 'see' with it. 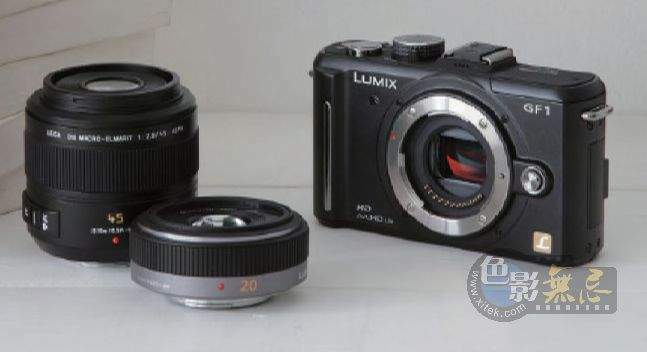 Wish Panasonic would hurry up and release their 20mm/1.7 pancake already. One guy on there thinks it takes even better pics than his 1DsMkIII w/ 85/1.2L! Oh, come on now! But I could see how you could take pictures with this camera and a small zoom that you simply couldn't attempt with a beast like 1Ds3/85L. Plus I'm not really a fan of how they tend to apply a saturation curve to all the pics. Really?! Can't say I've ever noticed this and I've got thousands of pics up there. Since the judging audience were primarily non-camera folk maybe they preferred the Oly colors better. When I had my 10D I wasn't a fan of how 'cool' the pics came out sometimes. Re: Flickr - Hmmm, I dunno, but all the pics I've seen on there always tend to be bright and punchy no matter what. Picasa and Photobucket on the other hand tend to 'wash' pics out. I really should bite the bullet and just get the 17mm pancake and enjoy modern niceties like AF. I think there has become something of a Flickr style - mad, popping colours garner views and faves and stupid animated GIF "awards", etc. It's almost become the signature community style by osmosis. I'm not immune to it - in fact, it's quite a shock when I put a 2007 photo next to a 2009 photo, how much more I saturate now. Not only have I come to prefer those sort of in-camera settings but I work up RAW images to be moderately punchy too. Photos I thought were good portraits two years ago look quite bland to me now. Yeah I feel the punchy Flickr colors are sort of a response to the whole 'flat' look of digital in general - S-curves go a long way towards reclaiming that awesome film color. Some of the corner softness inside the store is cause the corners are not in the plane of focus - some of it is because of the stretching. I don't mind - people who only look at corners in a picture are a bit perverse, anyway. Oh, these are loads better. It's going to be a great street/verite camera, isn't it? (For clickthroughs, go to All Sizes, choose Medium, copy the HTML from "option 1", and "Convert simple HTML to BBcode" before you post). Made you a contact, btw. Likewise. Really love the set from the parking lot. Did you do a lot of processing on them? They look very like transparency to me, a very natural quality. Am excited about this cam again. Thanks guys! Reciprocated - you both have some great stuff in your stream! Ugh discovered that I managed to put a nice little ragged scratch on the bottom casing. Probably after the warranty expires on this thing I'll take it apart and spray paint the top and bottom parts black. Received the leatherette kit from Aki-Asahi and have applied it - it looks quite fetching in person, reminds me of my old Canonet. took these in SF this past week. think I'm finally getting used to this, after having made an estimated 1500 exposures since owning it! camera in general is very discreet - out of about 4 days of shooting only 1 person realized I took a picture of him, and I think he was one of the numerous SF crazies. outside of SFMOMA some guy with a Leica M8 and a 35mm Summilux stopped and asked me about it - he even let me put the Summilux on my E-P1 - thing is crazy sharp, I had no problem nailing focus without the MF zoom, but of course it was 70mm EFOV. Good stuff. You know you've got a desirable thing if strangers are lending you their Summicrons. Guy in the park on Saturday with a Leica R9 (with digital back) certainly wasn't offering me his Summicron. Not that I could've done anything with it. I was given an old OM20 at the weekend, so, if anyone near me gets a E-P1 and an adaptor, I've got a nice Zuiko 50/1.8 they can play with. I didn't know R9s could be fitted with digital backs! I don't know anything about Leica's SLR system in general so... obviously the sensible thing for all DSLR manufacturers to do is to come out with models with interchangeable backs, but then how would they make their money? 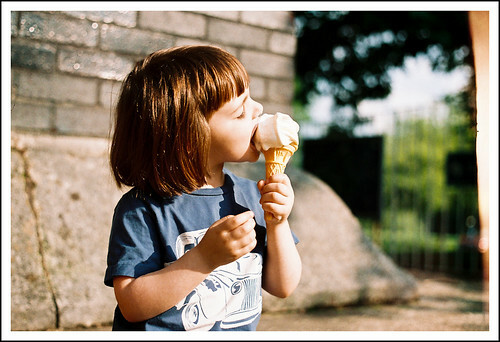 I love OM cameras - smaller than the Canon/Nikon equivalents but yet still so usable. it's funny to me that no matter how advanced DSLRs can get, their viewfinders still pale in comparison to even the most basic of 70s SLRs. I've shot with 1D and 1Ds's and they still didn't match my old OM-G. I am still rocking my OM-10. It's Photoworks ASA 200 negative film - a friend from the US left a couple of rolls here a while ago (they appear to be a Seattle-based company, I don't know whether this is rebranded Fuji or something - there's no manufacturer name on the negatives). It's actually a year beyond its expiry date. They're breathed on a little in Lightroom but I didn't really saturate them any more, just filled in the bottom end and altered the yellows a bit to tally with the prints. Nice mid-to-late afternoon summer light. Do wonder about that light leak though. Along with the OM20 and the Zuiko 50/1.8, my friend gave me a Miranda 28/2.8 and a Vivitar flashgun. Very odd feeling of deja vu using it - I think my brother had this very camera (I thought it was the older OM10 but that wouldn't have been compatible with his motor drive) and I took pictures at his (first) wedding with it in Feb '85. He got all his SLR gear stolen on holiday a year or so later and never got back into it. mid-to-late afternoon light is great light to shoot in, and a big neener-neener to all those who still shoot in B&W exclusively. you ought to be able to find a DIY kit on eBay to fix the light leak - I remember buying a kit for about twenty bucks to fix a couple of old fixed lens rangefinders (Canonet, XA) , and it came with strips of foam in all sorts of widths as well as lots of black felt. I think they claimed there was enough material to fix 10 or so cameras in a kit. you might as well replace them anyway since the camera's getting on what, 40 years old? Not quite that old - OM20 was 1983. May look into that kit. It wouldn't be that much of a chore to just tape the hell out of the thing with every new film. What with the Bronica, the FTb, the EOS 10, the EOS IX7, the Blackbird Fly and the K1000 all competing for attention (and with me trying to keep processing costs under £20/month), it's not like I change film often*. 24 exposures on one trip to the park was very unusual. was interested in the E-P1 at 1600 ISO and took it out - 5.6 @ 1600 and 0.3 EV got me around 1/80-1/120 shutter speeds in the brightly lit streets of HK. still on the lookout for a reasonably wide fast lens - come oooon, Panny 20mm/1.7. it's not really a camera until you've taken a picture of a baby with it is it? 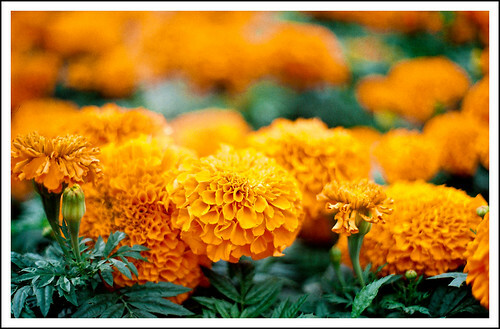 this is with an old Canon 50mm/1.8 - for the Canon rangefinder systems. has 10+ aperture blades for that smooth and creamy bokeh. contrast is a little low - but good overall. GF1 info out on DPR! it has an EVF! 20mm 1.7 details also released. everything but the price. The G1 and GH1 have been widely praised for their high resolution viewfinders; the Olympus E-P1 criticized for it's lack of one. The GF1 sits somewhere between the two, offering an optional 'Live View Finder' (the DMC-LVF1), which clips onto the hot shoe. The resolution is nothing like the G1/GH1 (202k pixels), nor is the finder anywhere near as large - it's more like a mid-range bridge or super zoom camera than an SLR (the LVF1 gives you around 0.52x magnification, compared to the G1's 0.7x magnification). From a size point of view, therefore, it's not far off most entry-level digital SLRs, but from a resolution point of view you're not going to be using it for fine focus checking. But it does work, and it does allow you to use the camera at eye level if that's how you prefer to shoot, and in very bright light (where the main screen suffers the usual glare problems. The viewfinder image may be small and you may be able to see the pixels, but it's pretty sharp and contrasty, and has a high frame rate (60fps). Best of all you can tilt it up through 90 degrees; great for macro and studio work. We understand the downgrade from the G1/GH1 (apparently the engineers did try, but it proved impossible to make a removable version), but we're slightly disappointed that, unlike its bigger siblings, the GF1 doesn't have the option to use the main screen as a status panel when shooting with the viewfinder; it's one or the other. Oh, that's really nice! Do you miss the vewfinder on the Oly? Leica making a big announcement next week too. I kind of do, actually - manual-focusing is a pain on the LCD. it's not really a problem when shooting with a wide-angle, but it's a big pain when shooting with a portrait length/telephoto; not only do you have to zoom in to adjust focus, but you have to keep the camera very steady otherwise the image jumps all over the place. I may be chasing after a white whale when I say I want an EVF or a LCD screen that can fine-focus without zooming in; I don't remember being too impressed by the G1's EVF when I played around with it ages ago. 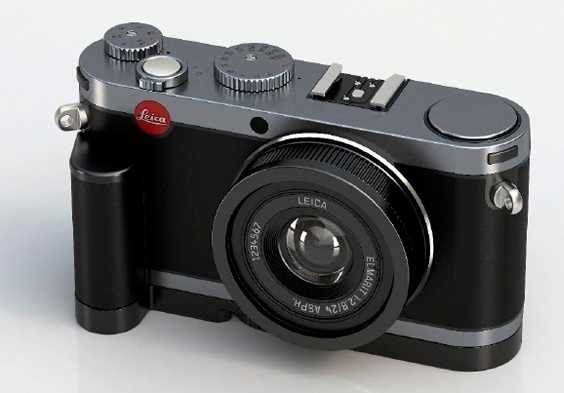 Presumably the GF1 with a leica badge on it and an M lens. X1 announced! less exciting than I thought it would be. basically a fixed lens w/ an APC-S sensor, no optical finder. you could get a E-P1 or GF1 kit with a 35mm/2.8 or 40mm/1.7 equivalent for less than half the price. but that's always been the rub with Leica hasn't it? I'd seriously consider selling everything and a kidney if it had an optical finder - would just be like using one of the old fixed lens rangefinders, like a Canonet or Oly RC. also makes me feel better about my E-P1 having a "cheap" LCD when the X1 has one that's 1. smaller and 2. the same res! Had an extended play with the Panasonic G1, GF1 and Oly E-P1 in a store over the weekend; the G1 is really terrific, I think. The way it handles (that rubberised body! ), the speed of the AF, the clarity of the EVF. Really impressive. so: i'm debating between the G1, GH1, GF1, and the Oly? i don't see the advantage that the g1 has for its extra size - you'd be better off going with a larger sensor dslr i think. the gh1 looks better if you're into video, otherwise i think it's the gf1 for its portability - supposedly faster autofocus and better screen would swing it for me over the olympus. i'm just going on specs and samples though, sure that dyao has more insight. Yeah, from all the reviews I've been seeing, the EP-1 is pretty great, but the GF-1 is all kinds of better at focusing. focusing speed - do you expect DSLR-like focusing speed? GF1 has this, plus is all around more responsive than an E-P1 (which can be a little sluggish, especially if you're changing a lot of settings at once). my personal recommendation would be a GF1 kit with the 20mm - perfect all rounder. the main advantage of the GH1 is that it comes with a nice, video-ready 14-150 zoom with silent AF, and that it has a great EVF. GF1 can also do video, just not 1080p I think - it has a dedicated video button which is more convenient than the video mode on the E-P1s dial. 720P is still pretty great - I shot this at my local coffee shop...sure it could look way better if I knew the first thing about post processing video. IMO the main advantage of a M43 system over a compact DSLR system is the portability. the shutter sound, although different than the mirror slap, can be just as obtrusive - IIRC you did a lot of people photography in Africa, so that might be worth considering, how obtrusive you want to be. the responsiveness is a little worse than even an entry-level DSLR (at least in the E-P1's case) - the GF1's supposed to be better. AF is almost as good or as good as an entry-level DSLR - but certainly won't be as fast as a top of the line Canikon. also think about lens choice - at the moment I think there's only one killer lens out there right now for the M43 system and that's the Panasonic 20mm (40mm equivalent). however, the AF speed is not as fast as the 14-45, although it's still pretty fast. Panasonic and Olympus have released lens roadmaps and there's a 14mm (28mm equivalent) coming from Panasonic next year. NB prices for M43 stuff is still pretty inflated - for the price of a GF1 kit with 20mm you could easily get a secondhand DSLR with maybe 2-3 good lenses. I think if you can afford to wait, next year's going to bring a lot of new stuff - if rumors are to be believed, other manufacturers are going to get into the mirrorless, large sensor compact camera market, which will drive prices down all around. as it stands right now, I think the GF1 is the best iteration of all the good things about M43 - portable, responsive, great image quality (if you process from RAW - its JPEGs leave a lot to be desired). thanks for the info! i'm only paying for part of this thing, as it is gonna be a xmas present from the fam. i AM mostly interested in people pictures, and will likely do everything RAW by default. i had fun with the pics i took this summer, and learning the ins and outs of processing actually appeals to me. the lack of a viewfinder kinda annoys, but i guess the external one is ok? ah actually the external one is pretty lame compared to the one built in to the G1/GH1 and the external one for the E-P2! maybe Panasonic will release a better one in the future? one thing I forgot to mention is that the E-P1/E-P2 both have in-body image stabilization - basically the camera moves the sensor to compensate for any shaking of the camera. lets you shoot with a slower shutter speed - of course it won't help if your subject is moving, but it's great for still life, especially nighttime shots. in the end it's gonna be six of one, half dozen of the other. no matter which you get I think it'll be fine for people photography - people will just think you're using an oversized digicam, not a real professional SLR. hope it works out for you!! Skipping 203 messages at this point... Click here if you want to load them all. Lots of interesting new lenses have come out in the past few months, like the Olympus 75mm, 60mm macro and the Panasonic constant f/2.8 zooms. The biggest news lately is the GH3. E-PL5 looks to be pretty nice too, for high quality in a small package. GH3 is marketed as the pro-level (magnesium body, weather sealed) Panasonic. It's a good deal larger than the GH2 (or for that matter, OM-D). I bought an OM-D, and can't be happier. It has a bit awkward ergonomics, but its 5-axis in body image stabilization is a marvel, and the Sony sensor it uses is the best in m43 land. Panasonic refused to sell Olympus sensors larger than 12mp, so Olympus got Sony to produce a downsized 16mb m43 sensor with the nearly the dynamic range and color depth of the Sony sensors used in the Nikon D800 and D7000, newer Pentax K cameras, as well as their own NEX and Alpha lineups. The OM-D lags those cameras a bit in high ISO noise, but the physics of sensor size can't always be helped. The GX1 was widely lauded at release for being the true successor to the GF1 (rangefinder ergos with good controls). That said, its price has sunk faster than any other m43 camera to date from $800 to sometimes $400 in under 9 months. I'm definitely tempted to get a GX1 as a second body if they come down further, for conversion to full spectrum for UV/IR imaging. The 75mm f/1.8 and 60mm f/2.8 macro are both pretty stellar lenses, though the 150mm (35mm equivalent) focal length of the 75mm is awkward for anything but outdoor portraiture. I have the 60mm, and it will outresolve my OM-D's sensor across the frame both at 1:1 distance and distance. The Pany 12-35mm f/2.8 is pretty good (like the 7-14mm, its almost prime lens quality), but like the other non-Leica cobranded Panasonic lenses, it doesn't correct lateral chromatic aberration (purple fringing) well (Pany bodies do this via image processing). Not an issue for Olympus bodies if you shoot RAW and process via Lightroom 4. The Pany 35-100mm f/2.8 is probably similar, but at $1499 its kinda absurd. Anyone shooting at sport action focal lengths with that kind of budget would do better to get a Canon DSLR + 70-200mm L glass. Panasonic announced a 42.5mm f/1.2 at Photokina for 2013 release. Probably the ideal m43 portrait lens (equivalent to a 85mm f/2.4 in angle of view and depth of field control) if its as good as their 20, 25, and 45 macro primes. They also announced a 150mm f/2.8, which fills a big hole in the lens lineup, and I'll be very tempted if they also make a 2x teleconverter. DPReview µ43 talk: Some bright users, and some abusive ones. 4/3 Rumors: you are a gear geek, no? 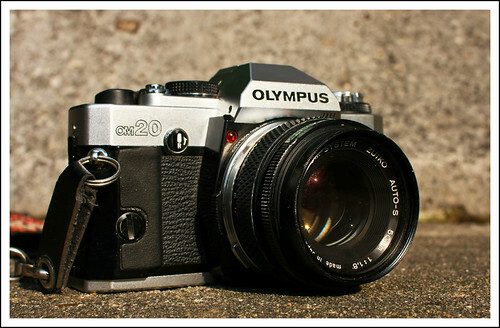 Mike Hendren - Customizing the Olympus OM-D E-M5: so many one guide isn't enough. OLYMPUS RAW codec: need to view thumbnails of your RAW images in Windoze? Great stuff, thanks. I'm totally sold on the OM-D. 5-axis stabilisation does look amazing in that youtube. I love mine. It's a fast, very fun camera that does a lot more than you'd expect. 0.7sec, 37mm, thx 5-axis stabilisation. liking the colours too, didn't notice the pinks on the wall being quite so outstanding when i shot it. So I've got a GF1 with the 20mm pancake. Ready for a second lens; might not buy another one for some time. Anyone have opinions on what it should be? I'll be shooting ummm ... touristy stuff I guess: city streets, landscapes, buildings. Not action sports that's for sure. Maybe the Olympus 45mm f/1.8 portrait lens. You already have the 40mm equivalent for street wides, obviously appreciate the benefits of primes, and like small packages. On m4/3 boards the 45 f/1.8 is considered one of the must-haves for prime shooters, wheras there's ongoing debate on the merits of 17.5, 20 and 25 for not-so-wide to normal duties. I want one (but got the 75mm instead in an insane parental gesture/loan repayment). review, review, review, review. If you're contemplating a third lens, the fine 14mm wide pancake can be had for a song new as it was a weird kit option. the portrait looks like it might be really useful, actually, thanks. The 45mm is a steal for the price. I was in the exact same situation 18 months ago (GF1 + 20mm pancake) and got it as my second lens, too. Still have it. If you don't often shoot in low light, you might check out the 60mm f/2.8 macro. A little more reach and it renders even more nicely IMO. Can't dispute that. Its a portrait length (90mm equiv) so suited to foregrounding and isolating subjects, is a flattering perspective for human torso-up shots, but its less suited to landscapes or architecture. Going significantly wider than the 20mm he has there's the 6mm fisheye, the 7-14mm f/4.0 (ultra-wide rectilinear zoom, pricey, no filter ring, near prime sharpness at 7mm end), the 9-18mm f/4-5.6 (light/compact collapsable zoom, kit zoom image quality), the 12-35mm f/2.8 (the Panasonic pro-spec event/walkabout zoom, nosebleed pricey, near prime image quality at 12mm end), the 12mm f/2.0 (landscape prime, pricey, metal build, well corrected, sharp to corners wide open), the 14mm f/2.5 (pancake wide prime, terrific value, needs CA correction in post), and quite a few (eight in fact) kit zooms that start at 14 on the wide end, the best regarded (for value) being the older Panasonic 14-45mm f/3.5-5.6. The most pertinent questions I had getting a wide were just how wide I wanted to go. 7mm lends itself to quirky deep focus compositions where you have close inanimate objects foregrounded against distant context. Human figures suffer a lot of distortion at 7mm, and frame tops & bottoms can be hard to fill. 9mm is easier to compose with, but people near edges are. 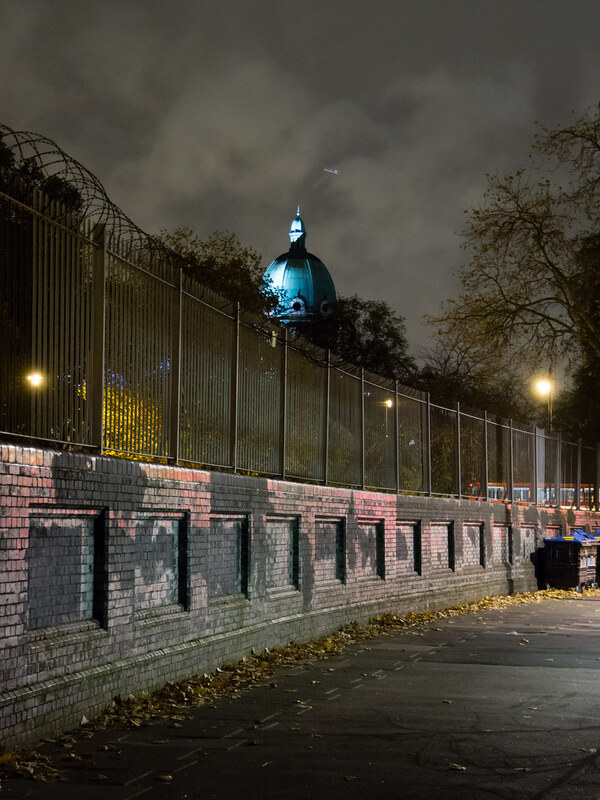 12mm lends itself to classic widescreen landscapes, and the f/2 speed on the prime is useful under street lights. 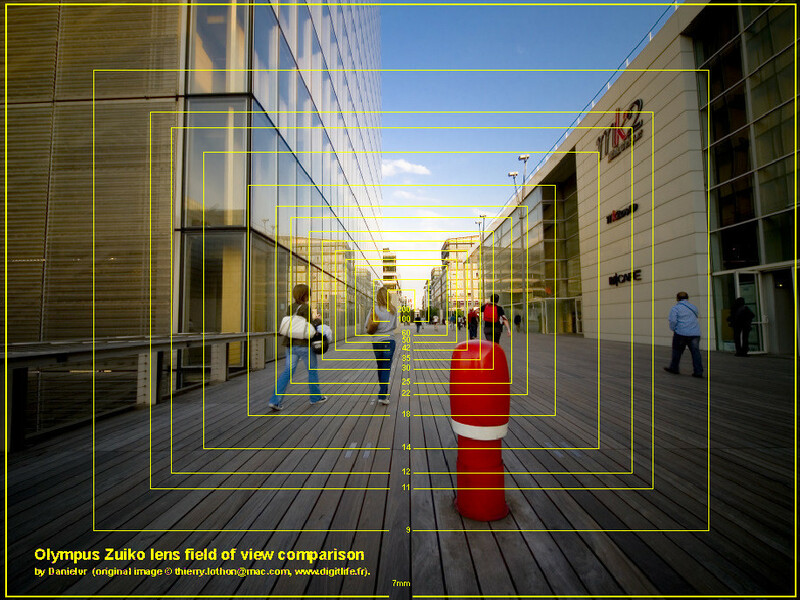 14mm (28mm in 135 format) is the 63-65° angle of view that delimits the wide end of the majority of compact zoom cameras (about 20% extend to 12mm). As you can see, its a lot easier suggesting a portrait lens than a wide lens. That's probably why I went there. ^ 9mm is easier to compose with, but people near edges are still significantly distorted. ^ also, the 14-45 zoom is more correctly the best regarded for sharpness, for value a number various flavors of 14-42 that can be had starting around $50-60 on Ebay, not so much because they're bad lenses (frankly they're about the same as current kit zooms on DSLRs) but because they were kit zooms (very common, parted out after bodies were discontinued, replaced by owners getting into primes etc). Going wider, the 14mm is a great place to start simply because it's so cheap. Software distortion correction robs the little pancake of a lot of its edge sharpness, but it's better than any of the alternatives at even double the price. I had the 14-45mm and was happy with its performance, but sold it because it sat unused. Compact primes are so much easier to carry day-to-day. where is all this cheap 14mm? panasonic one is still over $200 on amazon. is that cheap? Check eBay. Mostly Asian sellers have been selling new copies as leftovers from kits. I paid the equivalent of around $150 for mine (I'm in South Korea). that 12mm is tempting as well, dammit. Rt click for full res. Maybe this can help Lukas decide his next paycheck's destination. That's pretty neat! Thanks. I'm weighing a few different wide options for a nearish future purchase. Have a bid in on the 45mm portrait, fingers crossed. Have an upcoming trip, would be fun to shoot the whole thing with a new lens. Very nice, as 4/3 HG and SHG lenses are purportedly some of the finest glass ever, but my budget will wait a couple of years for the on-sensor PDAF to trickle down to the prosumer line. The video was pulled seconds before I clicked submit. Sorry. I saw it before it was pulled. Also noticed the usual peanut gallery complaining that it was ugly, but I think it looks fine. The size looks about perfect, speaking as someone who rarely uses my EM-5 without the add-on grip. It still looks smaller than the GH3. April fool's. Eff this day. Bought an E-M1 last weekend. Shooting sports and kids running around at work (elementary school), and autofocus does a great job keeping up! Almost every annoying thing about the E-M5 shooting experience is improved. Very happy. not that i need to spend more money, but trade GF1 for EM-1? Should this be a more general compact-system thread now or should we keep it purely u43? My wife is looking at something small and decent that has wi-fi. Was edging towards GX7 + 20/1.7 (had a play with GM1 - just TOO small; GM5 seems to fix that but at a cost). But we have both been wowed by friends' Fuji X cameras. One got the X100S (essentially a APS-C compact with a fixed 23 f/2 lens) and doesn't use his Canon 7D any more. I love my X100S more than any camera I've ever used. I went the GF1 to E-M1 route. Image quality is better (as you'd expect), but the real improvements are in handling and speed. The weather sealing has been useful. X100S/T would be very, very tempting if I only needed a ~35mm equiv. MJ: Has your wife looked at the E-PL bodies, or E-M10? The newest (E-PL7?) seems to tick all of those boxes, but is new enough that I don't think prices have had a chance to fall yet. The EPL7 is definitely also on the list of models to play with. I don't think she's going to consider anything that doesn't have a compatible pancake prime. System or compact, she may never buy another thing for it (yeah, right). So, GX7 + 20/1,7 is available as a bundle for £599. X100S (w/fixed 23/2,0) is around £799. EPL7 + Pan 20/1,7 = £638 (or £568 w/ Oly 17/2,8). Either of the u4/3rds cameras and she'd probably get the Oly 15/8,0 "lens cap" too, tbh. Or I'd just buy that for her as a stocking filler this Xmas. I really do like the look of that latest Pen. Too bad no one appears to offer an E-PL7 + 17mm/1.8 kit. Avoid the older 17/2.8 — slow and noisy AF, never gets sharp even stopped down. The 14mm/2.5 is another cheap option, and as tiny as they come. Corners are merely adequate, but it's very sharp in the centre and blisteringly fast to focus. I got one on eBay a couple years back. Spoiled for choice in µ43 land! Thanks for the tip! 14/2,5 looks nice. I think I meant the 9/8,0 body cap above, but that looks to be a fish-eye. 17/1,8 looks a bit chunkier, perhaps more at home on an OM-D? GX7 + 20/1.7 continuing to come down in price. Shame we missed the very limited double-cashback period over Xmas - would've effectively been around £450. GM1 is practically half its launch price now too. Fuji X still looks v tempting. Am swithering between the X100T and XT1 myself right now. The staff in Park Cameras on Rathbone Place were happy to let us play with a whole bunch of things for what seemed like hours (with a lunch break in the middle). While we knew the APS-C sensors of the Sony a6000 and Fuji X-E2 / X100T were going to offer better quality at the extreme end of things, the former was rejected on aesthetic grounds and the latter were just a bit too pricey*. Also, Pam was coming at this from the "better than a smartphone" angle rather than "lighter than my DSLR" angle that Fuji are really going for, so I think she's not that fussed about Fuji's superior EVFs but was concerned about their lack of touchscreens. Oh, look - it's me 10 weeks ago telling myself I wouldn't buy a Fuji. So...I got the X-M1 on a deal with the 27mm prime and the basic 16-50mm OIS zoom. It's cute, it's a bit cheap-feeling, but it has terrific dynamic range and colours straight off the bat. I was ready to be disappointed with how Adobe's Raw engine would deal with demosaicing files from the Fuji's unconventional sensor (everyone seems to complain about Lightroom + Fuji), but I like the default results and I've made a couple of sharpening presets following advice I read on a blog which improve things. It does seem like the X-M1 is the runt of the litter; Fuji are very good at rolling out substantial firmware updates but the M hasn't had one for a while and it's pretty much disappeared from the shops. I guess it's about to be discontinued. But that's why I got such a deal on it. And now Fuji are offering accumulative cashback on certain XF lenses. Oh stop it. Can you remind me which lenses you own for the Fuji X? I'm lobbying LFH to start stocking Fuji gear (there are lens hire companies which rent out Fuji, but, unlike the LFH model, they require deposits, extensive ID for couriering to the workplace, etc). I can't really justify a 56/1.2 but it would be a nice thing to have in my bag at a wedding, supporting the Canon 135L/24-105L workhorses. £225 off if you buy two lenses, BG. Just sayin'. i've got the 10-24mm, 23mm, 35mm, 56mm and 50-140mm. they're all among the sharpest lenses i've ever used, and the 56mm really is amazing - it would be great for weddings. everything i've read about the forthcoming 90mm f/2 seems to suggest it's optically even more impressive than the 56mm. I guess if I was going for a twofer, it would be 35 + 56, though the former is really very close to my little pancake, if two stops faster. But if I'm applying my don't-replicate-what-I-can-do-with-a-FF-Canon logic, the 35 is also redundant. Really pretty impressed with the 16-50 at the wide end, so not hankering after any fast wide primes. Well, no more than usual. The price of the X-T10 at launch is really low too - no more than the X-E2 currently is. Have they learned nothing from the big boys? Always ratchet up the RRP every model! And the firmware thing is remarkable - X-T1 w/FW 4.0 is a completely different camera to the one at launch, for no additional cost. They just get this stuff right, it seems. yeah, their commitment to continuous improvement is pretty amazing - when i came to sell my x100 to upgrade to the x100s it was a much, much more responsive camera than it was when i bought it thanks to the firmware updates. can't wait to give the new x-t1 firmware a try next month. i can't work quite out their thinking with the x-t10, though, because it seems so close in form and function to the x-t1 that i don't know why most people would choose the more expensive camera. the x-t10 has a slightly smaller viewfinder, a couple less physical dials and a smaller frame buffer but is basically the same camera at £500 instead of £800 afaict. if i had to choose a two-lens kit i think i'd go 23mm and 56mm - those are the lenses i seem to use most on the x-t1. the 35mm is really a phenomenal lens, though, especially considering the price. X-T1 is weather-sealed too, I guess. If you look at the price diff between, say, Canon 5D3 and 1DX, it seems to mostly come down to build quality (shutter that will last 3x longer, tank-like body, huge capacity battery), but what the cameras can actually do is very similar. Perhaps that's the thinking here. Quite what Fuji are going to do with the "flagship" X-Pro will be interesting.